To measure the safety of a company, we use the debt to equity ratio (D/E). Debt to equity ratio is a financial ratio indicating the relative proportion of equity and debt used to finance a company's assets. This ratio is also known as Risk or Gearing. It is equal to total debt divided by shareholders' equity. The two components of debt and equity are often taken from the firm's balance sheet, but the ratio may also be calculated using market values for both, if the company's debt and equity are publicly traded, or using a combination of book value for debt and market value for equity. 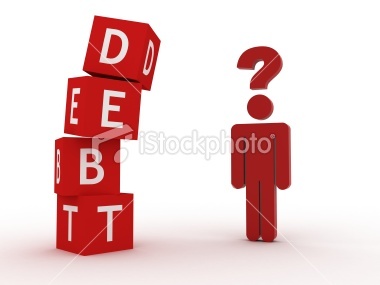 A high debt/equity ratio generally means that a company has been aggressive in financing its growth with debt. This can result in volatile earnings as the result of interest expense. If a lot of debt is used to finance increased operations, the company could potentially generate more earnings. If this earnings is greater than the debt cost (interest), then the shareholders will benefit. However, if the cost of this debt outweigh the return that the company generates on the debt through investment and business activities, the company can go bankrupt. The debt/equity ratio depends on the industry in which the company operates. For example, capital-intensive industries such as auto manufacturing tend to have a debt/equity ratio above 2, while personal computer companies have a debt/equity of under 0.5.